The West Vancouver Memorial Library Bookmobile parked behind the library. 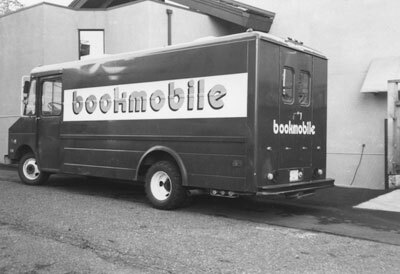 Lettering on the side of the truck reads "bookmobile". Scanned December 2011 using Epson Perfection V700 Photo at 600dpi and 100% of original image size. Alternate Versions: Lossless TIF from original scan at 600dpi and 100% of original print. W12.5 x H9 cm black & white print on photo paper.